Chhattisgarh, the first of the five states where assembly elections are being held, will witness the first phase of polling on 12 November in 18 of the 90-seat legislative assembly. The next phase will be held on 20 November in the rest of the constituencies. Chhattisgarh, the first of the five states where assembly elections are being held, will witness the first phase of polling on 12 November in 18 of the 90-seat legislative assembly. The 18 seats include Rajnandgaon, the constituency of incumbent Chief Minister Raman Singh, and all the seats in the Naxal-affected Bastar division of the state. The ruling Bharatiya Janata Party (BJP) holds only 5 of the 18 seats. 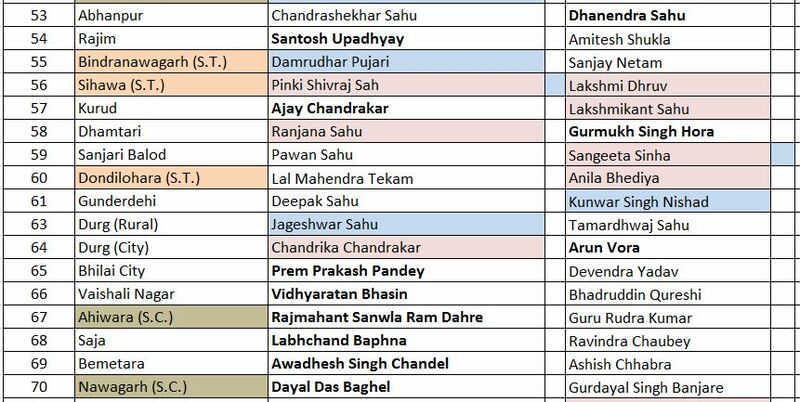 Twelve of the seats are reserved for Scheduled Tribe candidates while one is reserved for Scheduled Caste. The CM is up against Congress’ Karuna Shukla, he niece of former Prime Minister Atal Bihari Vajpayee. 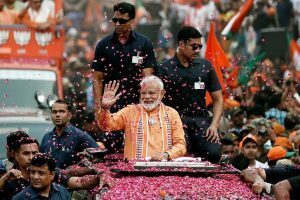 The second phase of polling will be held on 20 November for the remaining 72 constituencies, of which the BJP holds 44. Congress Chief Ministerial candidate Bhupesh Baghel will be in the fray from Patan. Baghel is the state Congress chief and a former minister in Madhya Pradesh government under Digvijaya Singh and Chhattisgarh government under Ajit Jogi. Chhattisgarh’s first Chief Minister, Ajit Jogi, who left the Congress to form his own party – Janata Congress Chhattisgarh (JCC) – will also see his political future scripted in the second phase. He is contesting from Marwahi, a reserved seat which his son, Amit, won in 2013 on a Congress ticket. Amit, who joined his father on their way out of the Congress, is not contesting. Jogi’s wife, Reenu, is contesting from Kota on a JCC ticket after she was denied a ticket by Congress. She is the sitting MLA from the constituency. Richa Jogi, the wife of Amit Jogi, is contesting from Akalatara against sitting Congress MLA Chunnilal Sahu on a BSP ticket. The JCC is fighting the elections in coalition with Mayawati’s Bahujan Samaj Party (BSP), which currently holds only one seat in the Chhattisgarh assembly, and the Communist Party of India (CPI), which has fielded two candidates – one from Dantewada and one from Konta in Bastar division. 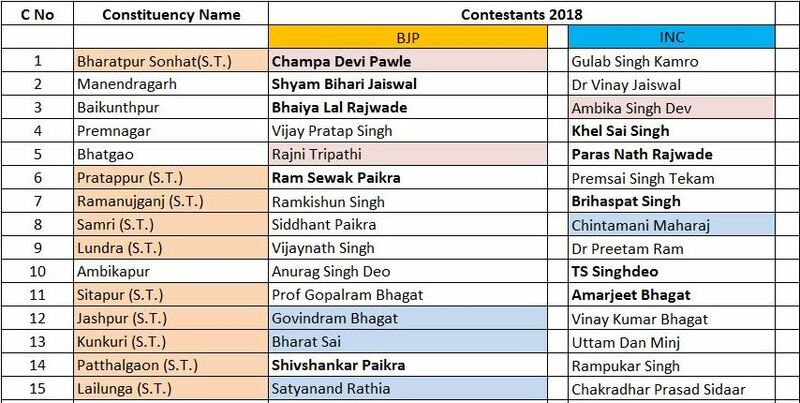 Besides the CM, other prominent BJP candidates contesting the polls are: Bhaiya Lal Rajwade from Baikunthpur, Prakash Pandey from Bhilai Nagar, Amar Agrawal from Bilaspur, Ajay Chandrakar from Kurud, Punnulal Mohile from Mungeli, Dayaldas Baghel from Nawagarh, Ramsevak Paikra from Pratappur, Brajmohan Agrawal from Raipur city south, and Rajesh Munat from Raipur city west. All the candidates are ministers in the Chhattisgarh government. State BJP president Dharamlal Kaushik is contesting from Bilha. Elections to these constituencies will be held on 20 November. 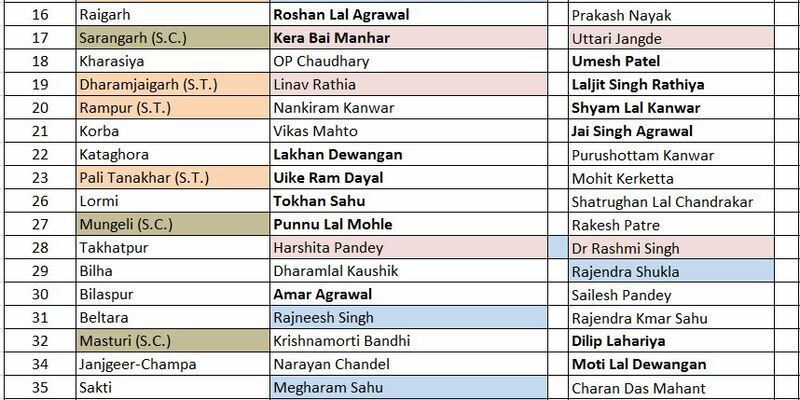 Among the prominent Congress candidates are Leader of Opposition in the Assembly TS Singhdeo from Ambikapur, party MP from Durg Lok Sabha seat Tamradhwaj Sahu, who is contesting from Durg rural, and former Union minister Charandas Mahant who is contesting from Shakti. BJP and Congress are contesting on all the 90 seats. According to reports, JCC is contesting on 55 seats, the BSP is contesting on 33 and CPI on 2. This is the first time that the JCC-BSP coalition is contesting assembly elections in the state. In 2013, the BJP won 49 seats in the 2013 elections while the Congress won 39. BJP has replaced 15 sitting MLAs. Fourteen of them are in the constituencies where polling is scheduled for 20 November. 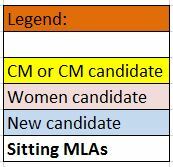 Like the BJP, the Congress, too, has fielded 9 new candidates replacing elected MLAs. Three of them will be in the fray in the first phase. 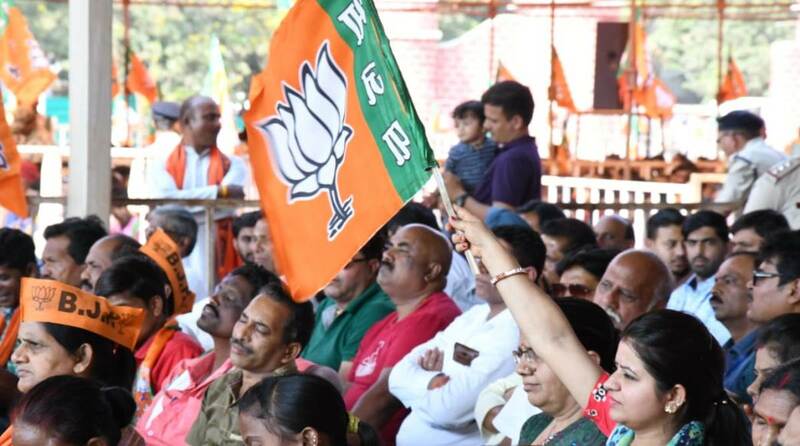 There are 13 women candidates contesting on BJP ticket in Chhattisgarh, of which 3 are sitting MLAs and 3 have replaced sitting MLAs. 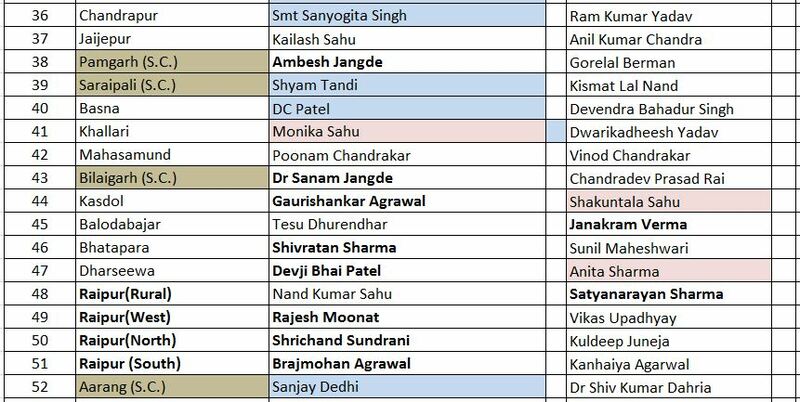 Congress has given tickets to 11 women of which 1 is a sitting MLA. Total number of reserved seats: 39, of which 10 are reserved for SC.